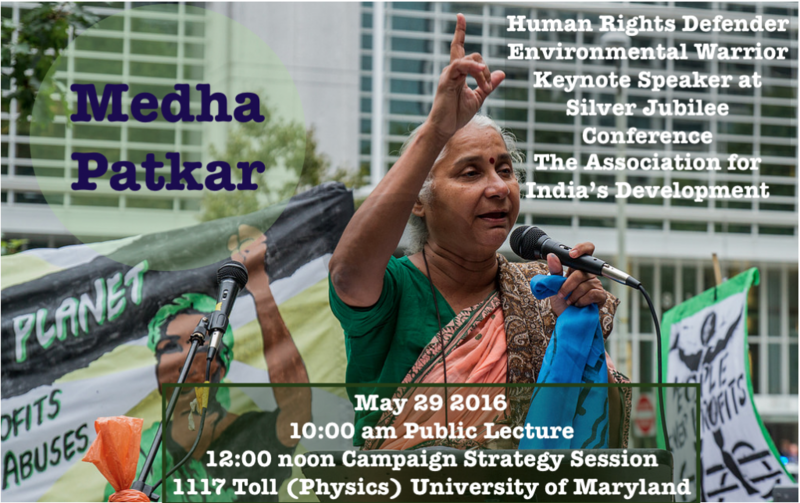 The Association for India’s Development is pleased to announce that human rights defender and environmental warrior Medha Patkar will deliver the keynote address at the “Silver Jubilee” conference in the 25th year of AID, to take place at the University of Maryland, College Park on May 28-30, 2016. The Keynote talks are free and open to the public. As a leader of the Narmada Bachao Andolan and India’s National Alliance for People’s Movements. she works on issues of urban and rural displacement and community rights to natural resources. She has been recognized with the Goldman Environmental Prize, the Right Livelihod Award, the BBC Green Ribbon and Amnesty International’s Human Rights Defender’s Award. Her keynote talk is at 10:00 am on Sunday May 29 and be followed by a campaign strategy session with other activists including Dr. Hiremath (founder, India Development Service) and from the Washington DC area. To attend the full AID Conference, register here. 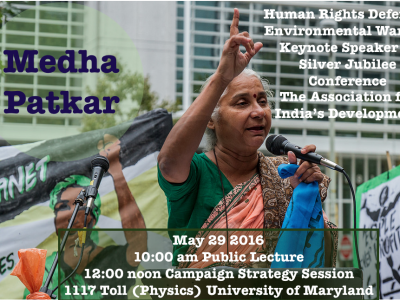 Read more about Medha Patkar on the AID Conference website.